Sharp has developed the Free-Form Display, a revolutionary advance over the conventional display shape concept that enables the creation of new display designs to match a variety of applications. LCDs have contributed to the emergence and spread of a range of application products by offering not just display-related functions such as high brightness, wide viewing angle, high resolution, and superb color purity, but also by providing added value through, for example, greater environmental performance and a superior user interface thanks to touch-panel functions. In addition, LCD application product manufacturers want to offer consumers products with a more polished design, and Sharp has responded by providing these manufacturers with displays that boast features like slim profiles, light weight, and thin bezels. 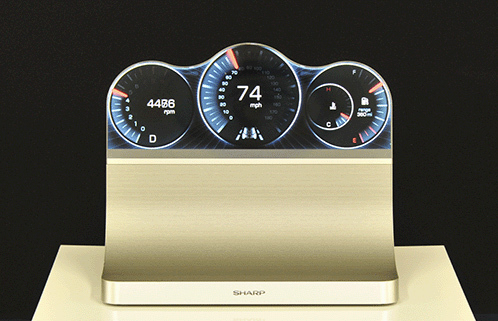 Continuing on this tradition of innovation, Sharp announces the development of the Free-Form Display, a device that can be shaped to meet a wide range of user needs thanks to the incorporation of IGZO technology and proprietary circuit design methods. Conventional displays are rectangular because they require a minimal width for the bezel in order to accommodate the drive circuit, called the gate driver, around the perimeter of the screen’s display area. With the Free-Form Display, the gate driver’s function is dispersed throughout the pixels on the display area. This allows the bezel to be shrunk considerably, and it gives the freedom to design the LCD to match whatever shape the display area of the screen needs to be. For in-vehicle applications, for example, this development makes it possible to have a single instrument panel on the car dashboard that combines a speedometer and other monitors. There are other possibilities for displays with sophisticated designs: these include wearable devices with elliptical displays and digital signage and other large monitors that draw the viewer into the onscreen world. Sharp plans to enter the mass-production stage for the Free-Form Display at the earliest possible date. Manufacturing bedding products from fishing line – airweave inc.